Two-tier concession at UPS sparks outrage | Fight Back! The new Combo Driver job will work inside the building and on the road as needed, unlike regular package drivers who work primarily on road. Their work will include Saturday and Sunday delivery, receive pay approximately $6 less than regular drivers, may include as long as 1.5 hour lunch breaks between shifts, and lack other protections, like protection from excessive overtime. "This is a scam that fixes nothing and introduces a whole new set of problems," commented Package Driver Peter Swan, Local 344. "Why not force the company to add more full-time driving jobs, strengthen 9.5 language for excessive overtime, strengthen weekend language, and add more full-time 22.3 jobs? I don't want to work alongside other drivers making six dollars less, working the weekends that I get to see my family. It's not good for them or me." Package Division Director Dennis Taylor argues that this new position is a remedy for the existing issues among Regular Package Car Drivers (RPCDs). In short, they claim the proposal is a way to relieve RPCD's of weekend work, excessive overtime, and add new full-time job positions to the workforce. 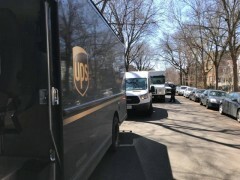 Today, approximately 120,000 or the 240,000 US-based UPS jobs are part time while full-time drivers often are overworked. Package Car Steward Daniel Ginsberg-Jaeckle, Local 705, added, "We can still fight and win a good contract. If this contract goes through as written, we're selling out a future generation and missing a huge opportunity to win a much-needed victory for the working class." Some other contract details include: Protections for RPCD driver work over Combo Driver work; a five-consecutive-day, two-day-off, 40-hour week, eight-hour day protection for both RPCDs and Combo Drivers; and a limit of Combo Drivers to 25% of all drivers in facilities operating on weekends (but may be renegotiated). While the new contract adds another 5000 full-time positions, it also states that the new Combo Driver classification can fulfill this promise, meaning less full-time inside warehouse jobs and the continued agony of part-time workers waiting over a decade for a full-time position if they can't drive a truck. Part-time worker Beau Dakota Hawk, Local 519, commented, "In many places part-timers wait over a decade to bid for an inside combo job when we can't become package car drivers. This proposal does not seriously address part-time issues. It creates far less full-time jobs than you'd suspect and it only favors people who can drive." Full national contract details can be found at upsrising.org. Voting on the contract will likely begin in the next couple months as regional supplements and local riders are finalized. The National UPS/Teamster Contract does not cover Local 705 and 710, who begin negotiations this week.